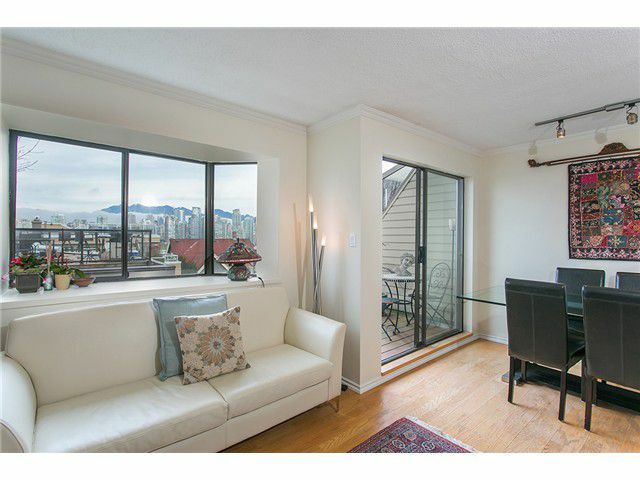 EXPANSIVE PANORAMIC CITY/MOUNTAIN from every room in this beautiful updated townhome. Reverse floorplan with bdrms downstairs to take advantage of the spectacular views from upstairs living & 2 large balconies. Updatesdone in the past include newer kitchen & appliances, bthrms, crown moldings, lighting, custom book shelving on upper landing. Beautiful oak wood floors. Wood burning fireplace. Extra storage locker. Pro-active well managed complex offers landscaped shared courtyard with mature garden & seating areas, secure parking, bike rack. Minutes to Granville Island, restaurants, shopping, transit, downtown.